As you may have noticed, I’m fond of music, so I like to include reviews of some of the concerts I’ve seen to help promote the artists. Sometimes you go to a concert where you are either unfamiliar with the opening act(s) or even the headliner. Since you don’t know what to expect, you can either be pleasantly surprised or occasionally disappointed. Then there are the times when the singer begins and you think “that voice can’t possibly be coming out of that person!” Sean Rowe, who opened for Marketa Irglova, is one of those performers. The deep base voice was entirely unexpected, but fortunately, in a pleasant way. A singer/guitarist from upstate New York, his folk style perfectly complimented the headliner. The show began at a very Irish time of 8:20 pm. It was held in St. Nicholas Church, but instead of the being in the nave of the church, where the Tunes in the Church series took place, the performers were arranged under a stone canopy in the center. Although both Sean and Marketa mentioned echoes from where they were playing, I didn’t notice it from five rows back. The acoustics are amazing in that place. 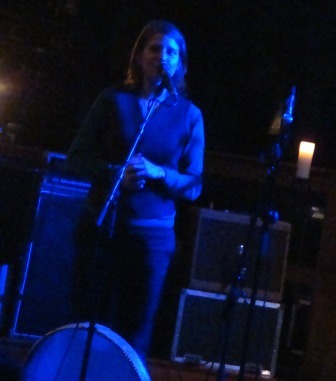 Marketa primarily performed tunes from her new solo CD Anar, a beautiful collection of folk-style tunes. 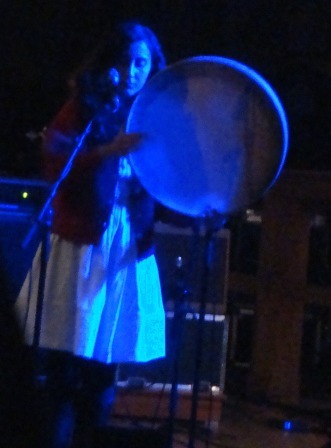 The woman on backing vocals, Aida Shahghasemi, also played a most interesting instrument called a DAF which is a frame drum that looks like an oversized bodhrán, but could make a number of different sounds. She showcased the versatility of the instrument during a solo tune. This was the last stop on their European tour and we were treated to a lengthy encore as Marketa mentioned she was having such a good time, she didn’t want it to end. I don’t think the audience of around 200 people did, either, as there was a standing ovation after the final tune, her only pre-solo piece from the movie Once – Falling Slowly.